The Yuga Cycle doctrine tells us that we are now living in the Kali Yuga; the age of darkness, when moral virtue and mental capabilities reach their lowest point in the cycle. The Indian epic The Mahabharata describes the Kali Yuga as the period when the "World Soul" is Black in hue; only one quarter of virtue remains, which slowly dwindles to zero at the end of the Kali Yuga. Men turn to wickedness; disease, lethargy, anger, natural calamities, anguish and fear of scarcity dominate. Penance, sacrifices and religious observances fall into disuse. All creatures degenerate. Change passes over all things, without exception. "The Krita Yuga was so named because there was but one religion, and all men were saintly: therefore they were not required to perform religious ceremonies... Men neither bought nor sold; there were no poor and no rich; there was no need to labour, because all that men required was obtained by the power of will... The Krita Yuga was without disease; there was no lessening with the years; there was no hatred, or vanity, or evil thought whatsoever; no sorrow, no fear. All mankind could attain to supreme blessedness. The universal soul was White... the identification of self with the universal soul was the whole religion of the Perfect Age. In the Treta Yuga sacrifices began, and the World Soul became Red; virtue lessened a quarter. Mankind sought truth and performed religious ceremonies; they obtained what they desired by giving and by doing. In the Dwapara Yuga the aspect of the World Soul was Yellow: religion lessened one-half. The Veda was divided into four parts, and although some had knowledge of the four Vedas, others knew but three or one. Mind lessened, Truth declined, and there came desire and diseases and calamities; because of these men had to undergo penances. It was a decadent Age by reason of the prevalence of sin." And now we are living in the dark times of the Kali Yuga, when goodness and virtue has all but disappeared from the world. But when did the Kali Yuga begin? And when does it end? 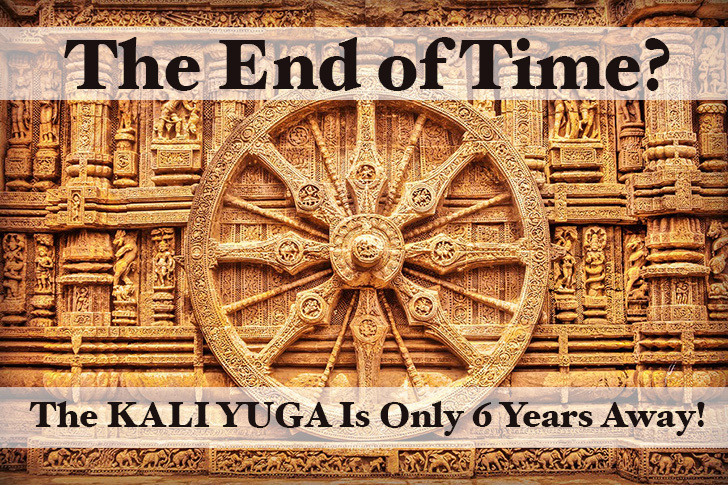 In spite of the elaborate theological framework which describes the characteristics of this age, the start and end dates of the Kali Yuga remain shrouded in mystery. The popularly accepted date for the beginning of the Kali Yuga is 3102 BC, thirty-five years after the conclusion of the great battle of the Mahabharata. This is remarkably close to the proposed beginning of the current "Great Cycle" of the Mayan Long Count Calendar in 3114 BC. It is of interest to note that in both of these cases the beginning dates of the respective cycles were calculated retrospectively. The Mayans had recomputed their ancient calendars sometime between 400 BC to 50 CE, at the ceremonial center of Izapa in Mexico, and fixed the starting date of the current Great Cycle of their Long Count Calendar. And in India, sometime around 500 CE, a major review of the Indian calendric systems had taken place. It was during this time that the renowned astronomer Aryabhatta had identified the beginning date of the Kali Yuga as 3102 BC. Why was it suddenly necessary for two ancient civilizations to re-calculate dates that should have been an integral part of their calendric systems? How did such important time-markers slip out of their collective memory? We will revisit these questions later. It is generally believed that Aryabhatta had calculated the start date of the Kali Yuga on the basis of the information in the Sanskrit astronomical treatise, the Surya Siddhanta, according to which the five "geocentric planets" (i.e. the planets visible to the naked eye) -- Mercury, Venus, Mars, Jupiter and Saturn -- were aligned to 0° of Aries (near the star zeta Piscium) at the beginning of the Kali Yuga. He, thus, arrived at the date of 17/18 February, 3102 BC as the starting point of the Kali Yuga. However, modern simulations carried out by Richard Thompson show that on 17/18 February, 3102 BC, the five geocentric planets occupied an arc of roughly 42° in the sky and were scattered over three zodiacal signs -- Aries, Pisces and Aquarius. This cannot be considered as a conjunction by any means. Far more spectacular 'alignment' of planets has occurred in the preceding and succeeding centuries. In other words, the conjunction of geocentric planets at 0° of Aries that was supposedly targeted by Aryabhatta did not take place in 3102 BC. Does this mean Aryabhatta made an error in his back calculations? Not really. For, the Surya Siddhanta does not ever specify that such an alignment of planets took place at the beginning of the Kali Yuga. On the contrary, the Surya Siddhanta explicitly states that this conjunction of planets at 0° of Aries takes place at the end of the Golden Age (Satya / Krita Yuga). The text states: "Now, at the end of the Golden Age (Krita Yuga), all the planets, by their mean motion -- excepting however their nodes and apsides -- are in conjunction in the first of Aries". Unfortunately, however, this simple statement was misrepresented by some of the early commentators, in their eagerness to find an astronomical rationale for the 3102 BC date, and it has subsequently been promulgated as a fact. Similar information regarding the conjunction of planets is also present in the ancient Greek texts. In the Timaeus, Plato refers to a "Perfect Year" which elapses at that moment when the sun, moon and the planets all return to the same relative position despite all their intervening reversals. This idea was echoed by the 3rd century Roman writer Censorinus, who said that the orbits of the sun, moon and the five wandering planets complete one "Great Year of Heraclitus", when they are brought back together at the same time to the same sign where once they were. This "Great Year" which is known by various other names -- "Perfect Year", "Platonic Year", "Supreme Year of Aristotle" etc. -- was variously represented as being of 12,954 years (Cicero) or 10,800 years (Heraclitus) duration. There can be no doubt that the 3102 BC date for the Kali Yuga was not based on any information in the Surya Siddhanta or any other Sanskrit text. The date virtually pops out of nowhere. Before 500 CE, this date was not mentioned in any Sanskrit text. From where, then, did Aryabhatta obtain this date? There seems to be no indication that Aryabhatta had computed this date himself. There is a single, stray reference to this date in the Sanskrit text Aryabhatiya, where Aryabhatta mentions that the text was composed 3,600 years into the Kali Yuga, when he was 23 years old. Since the Aryabhatiya was composed in 499 CE, the beginning of the Kali Yuga can be traced back to 3102 BC. The statement, by itself, does not reveal any information about the astronomical basis on which the date was calculated, or whether the calculation was performed by Aryabhatta himself. It is possible that this date was adopted by Aryabhatta from some other source. The vagueness surrounding the origin of this date makes its validity highly suspect. The task of figuring out this date from the ancient Sanskrit texts, however, is fraught with difficulties, since a number of inaccuracies have crept into the Yuga Cycle information contained within them. "The writers of the Puranas, many of which appear to have been written during the first few centuries of the Christian, era, were naturally unwilling to believe that the Kali Yuga had passed away... An attempt was, therefore, made to extend the duration of the Kali Yuga by converting 1000 (or 1200) ordinary human years thereof into as many divine years, a single divine year, or a year of the gods, being equal to 360 human years... this solution of the difficulty was universally adopted, and a Kali of 1200 ordinary years was at once changed, by this ingenious artifice, into a magnificent cycle of as many divine, or 360 X 1200 = 432,000 ordinary years." Yukteswar also clarified in the book The Holy Science (1894), that a complete Yuga Cycle takes 24,000 years, and is comprised of an ascending cycle of 12,000 years when virtue gradually increases and a descending cycle of another 12,000 years, in which virtue gradually decreases. Hence, after we complete a 12,000 year descending cycle from Satya Yuga -> Kali Yuga, the sequence reverses itself, and an ascending cycle of 12,000 years begins which goes from Kali Yuga -> Satya Yuga. Yukteswar states that, "Each of these periods of 12,000 years brings a complete change, both externally in the material world, and internally in the intellectual or electric world, and is called one of the Daiva Yugas or Electric Couple." The 24,000 year duration of the complete Yuga Cycle closely approximates the Precessional Year of 25,765 years, which is the time taken by the sun to "precess" i.e. move backwards, through the 12 zodiac constellations. Interestingly, the Surya Siddhanta specifies a value of 54 arc seconds per year for precession, as against the current value of 50.29 arc seconds per year. This translates into a Precessional Year of exactly 24,000 years! This raises the possibility that the current observed value of precession may simply be a temporary deviation from the mean. The concept of an ascending and descending cycle of Yugas is not a proposition that Yukteswar conjured out of thin air. This idea is still prevalent among the Jains of India, who are one of the oldest religious sects of the country. The Jains believe that a complete Time Cycle (Kalachakra) has a progressive and a regressive half. During the progressive half of the cycle (Utsarpini), there is a gradual increase in knowledge, happiness, health, ethics, and spirituality, while during the regressive half of the cycle (Avasarpini) there is a gradual reduction in these qualities. Each half cycle is comprised of six smaller periods, and together these two half cycles constitute a complete Time Cycle. These two half cycles follow each other in an unbroken succession for eternity, just like the cycles of day and night or the waxing and waning of the moon. It is possible that Yukteswar may have been influenced by the belief system of the ancient Jains; or he may have based his ideas on ancient oral traditions that are not a part of the mainstream documented knowledge. "Drawing on the myth in Plato's Statesman, Vernant also claimed that the temporal framework of Hesiodic myth, that is, the succession of races, is not linear but cyclical; at the end of the age of iron, which he divides into two, the cycle of races starts again with a new golden age or, more likely, a new age of heroes, as the sequence reverses itself... Vernant himself offers a solution when he remarks that 'there is not in reality one age of iron but two types of human existence.'" This is highly interesting. Jean-Pierre Vernant, who is a highly acclaimed specialist in ancient Greek culture, clearly believes that the Cycle of the Ages reverses itself as per Hesiod's account. Not only that, he states that the Iron Age has two parts, which corresponds exactly to Yukteswar's interpretation in which the descending Kali Yuga is followed by the ascending Kali Yuga. We can surmise, in this context, that the "Age of Heroes", which immediately followed the Bronze Age in Hesiod's account, must be the name ascribed by Hesiod to the descending Kali Yuga. Since so many inaccuracies have crept into the Yuga Cycle doctrine, as pointed out by Yukteswar and Tilak, we also need to question the accuracy of the relative durations of the Yugas mentioned in the Sanskrit texts. Although the Yuga Cycle is mentioned in the mythic accounts of around thirty ancient cultures, as described by Giorgio de Santillana, professor of the history of science at MIT, in the book Hamlet's Mill (1969), we find very little information regarding the relative durations of the different ages within this cycle. This is quite surprising. Nearly all the accounts tell us that virtue and righteousness decreases as we move from the Golden Age to the subsequent ages. Some of them specifically mention that virtue decreases by a quarter in every age. However, there appears to be scant mention of the durations of the ages themselves. If the duration of each Yuga decreased from one Yuga to the next, shouldn't this important point also have been mentioned in these accounts? Therefore, the durations of the four Yugas mentioned in the Sanskrit texts (i.e. 4800, 3600, 2400, and 1200 years) deviate from the norm. The duration of each Yuga, in this sequence, decreases by 1200 years from the previous one. This is an arithmetic progression which is rarely, if ever, found in natural cycles. This seemingly unnatural sequence raises the question whether the Yuga durations were deliberately altered at some point in the past, in order to give the impression that the duration of each Yuga decreases in tandem with the decrease in virtue from one Yuga to the next. It is important to note that the ratio's of the durations of the four Yugas in this sequence is 4:3:2:1. This gives the superficial impression that the duration of each Yuga is reducing by a quarter from one to the next. But that is actually not the case. They are decreasing by a fixed number of years i.e. 1200 years. "Further, Brahmagupta says that 'Aryabhatta considers the four yugas as the four equal parts of the caturyuga (Yuga Cycle). Thus he differs from the doctrine of the book Smriti, just mentioned, and he who differs from us is an opponent.'" The fact that Aryabhatta believed the four yugas to be of equal duration is extremely pertinent! Al-Beruni reasserts this in no uncertain terms: "Therefore, according to Aryabhatta, the Kali Yuga has 3000 divya years... each two yugas has 6000 divya years... each three years has 9000 divya years." Why would Aryabhatta subscribe to such a belief? Did he have access to sources of information that are lost to us now? Surprisingly, it was not only Aryabhatta, who held this point of view. Another celebrated astronomer of ancient India was Paulisa, who had apparently earned Brahmagupta's favor by supporting the 4:3:2:1 ratio for the duration of the yugas. According to Al-Beruni, however, "it is possible that Paulisa simply mentions this method as one among others, and that it is not that one in particular which he himself adopted." This is evident from Paulisa's belief regarding the caturyuga, as documented by Al-Beruni: "Of the current caturyuga (Yuga Cycle), there have elapsed three yugas, i.e. according to him 3,240,000 years i.e. 9000 divya-years. The latter number represents three-fourths of the years of a caturyuga." This indicates that Paulisa believed that each Yuga was of 3000 divine years' duration. He uses the same method while presenting his calculations for the duration of a kalpa where "he (Pulisa) has not changed the caturyugas into exact yugas, but simply changed them into fourth parts, and multiplied these fourth parts by the number of years of a single fourth part." "He is rude enough to compare Aryabhatta to a worm which, eating the wood, by chance describes certain characters in it without understanding them and without intending to draw them. 'He, however, who knows these things thoroughly, stands opposed to Aryabhatta, Srishena, and Vishnucandra like the lion against gazelles. They are not capable of letting him see their faces.' In such offensive terms he attacks Aryabhatta and maltreats him." We can now understand why Brahmagupta's opinion finally prevailed over that of the other astronomers of his time, and it certainly did not have anything to do with the inherent soundness of his logic, or the authenticity of his sources. It is time for us to stop standing in opposition to Aryabhatta, Paulisa, Srishena, Vishnucandra and others like the "lion against gazelles", and instead take cognizance of the very real possibility that the Yugas in the Yuga Cycle are of equal duration, and the 4:3:2:1 sequence of the Yugas may have been a mathematical manipulation that crept into the Yuga Cycle doctrine sometime prior to 500 CE. It is possible that this manipulation was introduced because people were inclined to believe that the duration of a Yuga should decrease in tandem with the decrease in virtue and human longetivity from one Yuga to the next. A neat formula was devised in which the total duration of the Yugas added up to 12,000 years. However, there was one problem. If the Kali Yuga is of 1,200 years duration, then it should have been completed many times over, since its proposed beginning in 3102 BC. In order to circumvent this potentially embarrassing situation, another complexity was introduced. Each "year" of the Yuga Cycle became a "divine year" comprised of 360 human years. The Yuga Cycle became inflated to 4,320,000 years (12,000*360) and the Kali Yuga became equal to 432,000 years (1,200*360). Humanity became consigned to an interminable duration of darkness. The original Yuga Cycle doctrine appears to have been very simple: A Yuga Cycle duration of 12,000 years, with each Yuga lasting for 3,000 years. This cycle is encoded in the "Saptarsi Calendar" which has been used in India for thousands of years. It was used extensively during the Maurya period in the 4th century BC, and is still in use in some parts of India. The term "Saptarsi" refers to the "Seven Rishis" or the "Seven Sages" representing the seven stars of the Great Bear constellation (Ursa Major). They are regarded as the enlightened rishis who appear at the beginning of every Yuga to spread the laws of civilization. The Saptarsi Calendar used in India had a cycle of 2,700 years; it is said that the Great Bear constellation stays for 100 years in each of the 27 "Nakshatras" (lunar asterisms) which adds up to a cycle of 2,700 years. The 2,700 year cycle was also referred to as a "Saptarsi Era" or a "Saptarsi Yuga". Fig 1: The Great Bear constellation (Ursa Major) is clearly visible in the northern sky throughout the year [right]. The seven prominent stars represent the Seven Sages (Saptarshi). The Great Bear constellation figures prominently in the mythology of many cultures. If the 2,700 year cycle of the Saptarsi Calendar represents the actual duration of a Yuga, then the remaining 300 years out of the total Yuga duration of 3,000 years (representing 1/10th of the Yuga duration), automatically represents the "transitional period", before the qualities of the subsequent Yuga are fully manifested. In accordance with the current convention, this intervening period can be broken up into two separate periods of 150 years each, one occurring at the beginning of the Yuga, known as Sandhya (i.e. dawn), and the other at its termination, known as Sandhyansa (i.e. twilight). The total duration of the Yuga Cycle, excluding the transitional periods, is equal to (2700*4) i.e. 10,800 years, which is same as the duration of the "Great Year of Heraclitus" in the Hellenic tradition! It is agreed by historians that the Saptarsi Calendar that was in use during the Maurya period in the 4th century BC, started in 6676 BC. In the book, "Traditions of the Seven Rsis", Dr.J.E. Mitchiner confirms this: "We may conclude that the older and original version of the Era of the Seven Rsis commenced with the Seven Rsis in Krttika in 6676 BC... This version was in use in northern India from at least the 4th century BC, as witnessed by the statements of Greek and Roman writers; it was also the version used by Vrddha Garga, at around the start of the Christian era." In fact, the recorded choronology of Indian kings goes back further than 6676 BC as documented by the Greek and Roman historians Pliny and Arrian. Pliny states that, "From Father Liber [Roman Bacchus or Greek Dionysus] to Alexander the Great (d. 323 BC), Indians reckon 154 kings, and they reckon (the time as) 6451 years and 3 months." Arrian puts 153 kings and 6462 years between Dionysus and Sandrokottos (Chandragupta Maurya), to whose court a Greek embassy was sent in 314 BC. Both indications add up to a date of roughly c.6776 BC, which is a 100 years prior to the beginning of the Saptarsi Calendar in 6676 BC. It is obvious from the accounts of Pliny and Arrian that they must have identified a specific king in the Indian kings list, who corresponded to the Greek Dionysus or Roman Bacchus, and whose reign had ended at around c.6776 BC. Who could that have been? According to the renowned scholar and Orientalist Sir William Jones, Dionysus or Bacchus was none other than the Indian monarch Rama. In his essay "On the Gods of Greece, Italy and India" (1784), Sir William Jones "deems Rama to be the same as the Grecian Dionysos, who is said to have conquered India with an army of satyrs, commanded by Pan; and Rama was also a mighty conqueror, and had an army of large monkeys or satyrs, commanded by Maruty (Hanuman), son of Pavan. Rama is also found, in other points, to resemble the Indian Bacchus." Sir William Jones also points out that, "Meros is said by the Greeks to have been a mountain of India, on which their Dionysus was born, and that Meru is also a mountain near the city of Naishada, or Nysa, called by the Grecian geographers Dionysopolis, and universally celebrated in the Sanskrit poems." Both Pliny and Arrian were aware of these associations. Pliny had placed the Dionysian satyrs "in the tropical mountains of India", while "we learn from Arrian (Hist.Ind. p 318, 321) that the worship of Bacchus, or Dionysus, was common in India and that his votaries observed a number of rites similar to those of Greece... On this account, when Alexander entered India, the natives considered the Greeks as belonging to the same family with themselves; and when the people of Nysa sent the principal person of their city to solicit their freedom of the Grecian conqueror, they conjured him by the well-known name of Dionysus, as the most effectual means of obtaining their purpose. 'O King, the Nyssaeans entreat thee to allow them to enjoy their liberties and their laws, out of respect to Dionysus .'" A later Saptarsi Calendar, still in use in India, began from 3076 BC. But, as Dr. Subhash Kak points out, "the new count that goes back to 3076 BC was started later to make it as close to the start of the Kali era as possible". This modification can be easily identified, since in 3076 BC, the Great Bear were in the "Magha" nakshatra (lunar asterism) as mentioned by Varahamihira in Brihat-Samhita (Brs. 13-3). But Subhash Kak points out that, "By the time of the Greeks, the naksatras were listed starting with Asvin (Surya Siddhanta 8.9). As Magha is the tenth naksatra in a count beginning with Asvin, one needs to add 900 years to find the epoch for the beginning of the cycle. This takes one to 3976 BC. One more complete Saptarsi Cycle of 2,700 years before that brings us to 6676 BC." Since the Dwapara Yuga immediately precedes the Kali Yuga, we are once again led to the conclusion that the Saptarsi Calendar with a start date of 6676 BC was counting time from the Dwapara Yuga. This Yuga Cycle timeline takes the beginning of the Golden Age to 12676 BC, more than 14,500 years before present, when the Great Bear was in the "Shravana" nakshatra (the Great Bear will advance by 3 nakshtras in every Yuga because of the 300 year transitional period). This agrees very well with the Indian tradition, since the Mahabharata mentions that in the ancient tradition the Shravana nakshatra was given the first place in the Nakshatra cycle. The timeline also indicates that the ascending Kali Yuga, which is the current epoch in which we are living, will end in 2025 CE. The full manifestation of the next Yuga -- the ascending Dwapara -- will take place in 2325 CE, after a transitional period of 300 years. The ascending Dwapara Yuga will then be followed by two more Yugas: the ascending Treta Yuga and the ascending Satya Yuga, which will complete the 12,000 year ascending cycle. The Sanskrit text Brahma-vaivarta Purana describes a dialogue between Lord Krishna and the Goddess Ganges. Here, Krishna says that after 5,000 years of Kali Yuga there will be a dawn of a new Golden Age which will last for 10,000 years (Text 50, 59). This can be immediately understood in the context of the Yuga Cycle timeline described here. We are now ending the Kali Yuga, nearly 5,700 years since its beginning in 3676 BC. And the end of the Kali Yuga will be followed by three more Yugas spanning 9,000 years, before the ascending cycle ends.